Here are some snazzy birthday facts about 6th of February 1912 that no one tells you about. Don’t wait a minute longer and jump in using the content links below. Average read time of 9 minutes. Enjoy! What day was my birthday Feb 6, 1912? February 6, 1912 was a Tuesday and it was the 37th day of the year 1912. It was the 6th Tuesday of that year. The next time you can reuse your old 1912 calendar will be in 2024. Both calendars will be exactly the same! This is assuming you are not interested in the dates for Easter and other irregular holidays that are based on a lunisolar calendar. There are 291 days left before your next birthday. You will be 108 years old when that day comes. There have been 39,156 days from the day you were born up to today. If you’ve been sleeping 8 hours daily since birth, then you have slept a total of 13,052 days or 35.73 years. You spent 33% of your life sleeping. Since night and day always follow each other, there were precisely 1,326 full moons after you were born up to this day. How many of them did you see? The next full moon that you can see will be on May 18 at 21:13:00 GMT – Saturday. Fun stat: Your first one billion seconds (1,000,000,000) happened sometime on October 15, 1943. If a dog named Bodey - a Havanese breed, was born on the same date as you then it will be 448 dog years old today. A dog’s first human year is equal to 15 dog years. Dogs age differently depending on breed and size. When you reach the age of 6 Bodey will be 40 dog years old. From that point forward a small-sized dog like Bodey will age 4 dog years for every human year. Otto becomes the first modern King of Greece. Jack Kilby of Texas Instruments files the first patent for an integrated circuit. Curious about this Fifth Avenue Cake? This is a party item you can activate and send to your friends when you play the free game Jump Birthday Party. It’s a fun and easy-to-play mobile game for all ages. Get free 1,000 gold coins when you download today! What does my birthday February 6, 1912 mean? 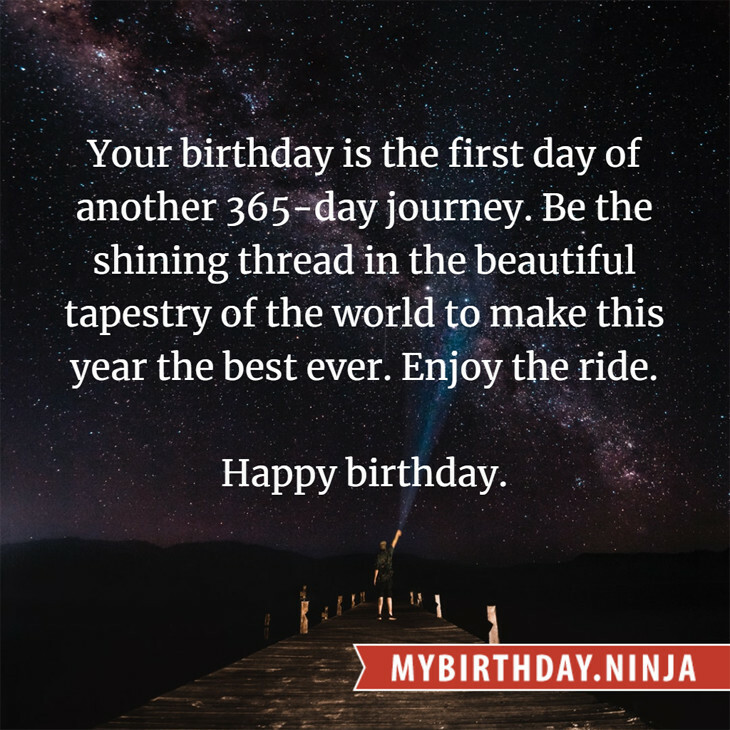 Your birthday numbers 2, 6, and 1912 reveal that your Life Path number is 3. It represents vision, imagination and joy of living. You possess a great talent for creativity and self expression. The following celebrities also have the same life path number: Tiffany Darwish, Joan Caulfield, Filip Topol, Heinrich Schlusnus, John Ford, Jeffrey Garcia, Maya Plisetskaya, Bobby Tench, Lee DeWyze, Johnny Goudie. What is the birthday horoscope for Feb 6, 1912? The Western zodiac or sun sign of a person born on February 6 is Aquarius ♒ (The Water-bearer) – a fixed sign with Air as Western element. The ruling planet is Uranus – the planet of originality. According to the ancient art of Chinese astrology (or Eastern zodiac), Pig is the mythical animal and Metal is the Eastern element of a person born on February 6, 1912. Fun fact: The birth flower for 6th February 1912 is Violet for modesty. What is the Love Match for Feb 6, 1912? When it comes to love and relationship, you are most compatible with a person born on March 17, 1912. You have a Love Match compatibility score of +124. Imagine being in love with your soul mate. On the negative side, you are most incompatible with a person born on August 7, 1920. Your incompatibility score is -114. You’ll be like a cat and a dog on a love-hate relationship. Arf-arf, I want to bite you. Meow-meow, stay away from me! I do not know how you feel about this, but you were a male ♂ in your last earthly incarnation. You were born somewhere around the territory of Borneo approximately on 625. Your profession was farmer, weaver, tailor. What is the popular baby name on 6 Feb 1912? 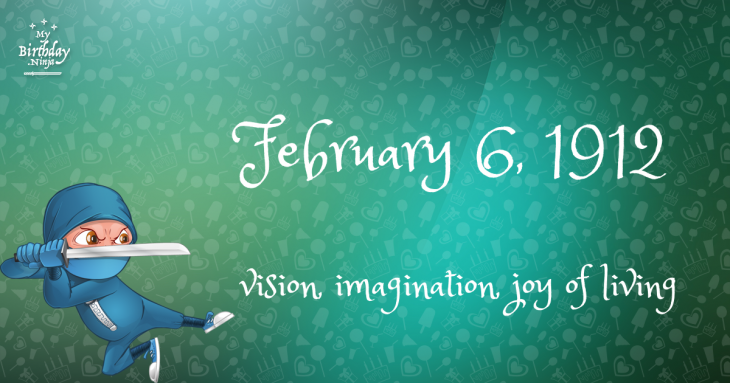 Here’s a quick list of all the fun birthday facts about February 6, 1912. Celebrities, famous birthdays, historical events, and past life were excluded. Try another birth date of someone you know or try the birthday of these celebrities: April 3, 1975 – Spiller, Italian DJ and producer; January 17, 1989 – Hollie-Jay Bowes, English singer-songwriter and actress; November 16, 1983 – Victor Vazquez, American rapper (Das Racist and Boy Crisis).